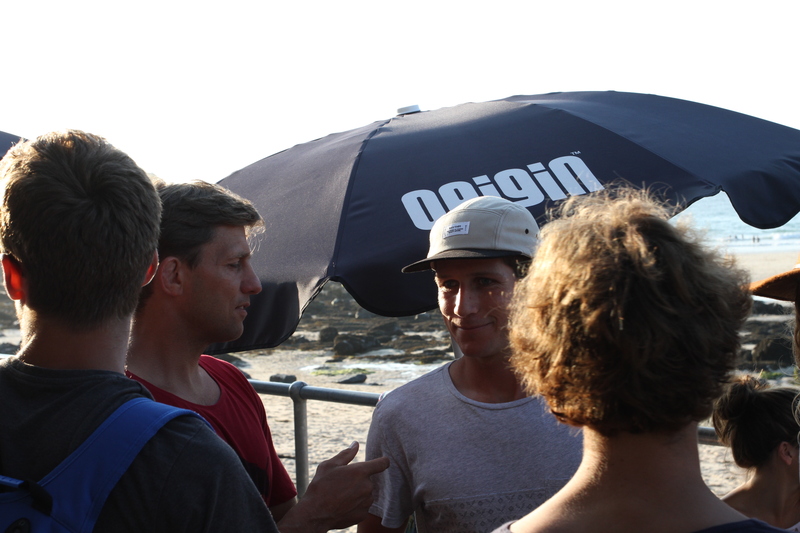 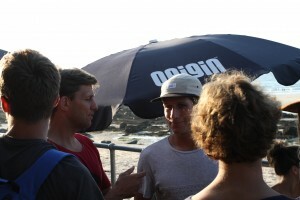 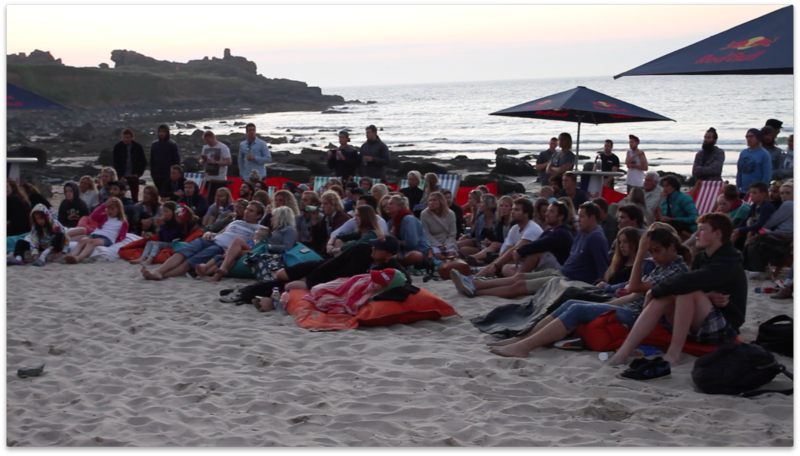 The prelude to The Swellboard Shootout came on Friday evening when the Red Bull Surf Cinema opened it’s doors again at Porthmeor West to entertain us with a new selection of surfing shorts supporting a main feature, BMX maestro Danny MacAskill’s new movie “Epicuen”. 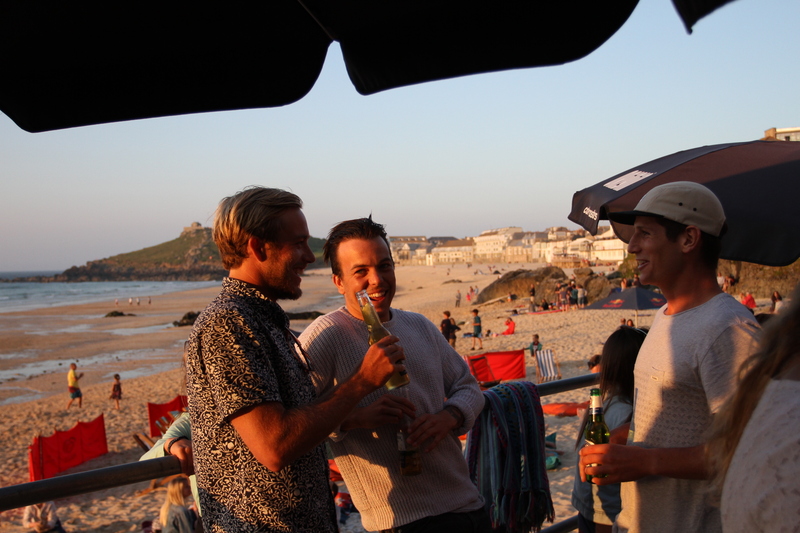 Most of the Surf School luminaries were there enjoying some R&R before a stacked weekend including Saturday Surf Club and regular coaching prior to the mayhem that was promised for Sunday. 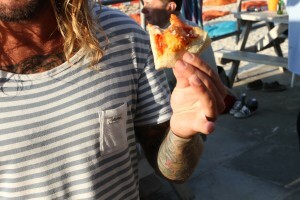 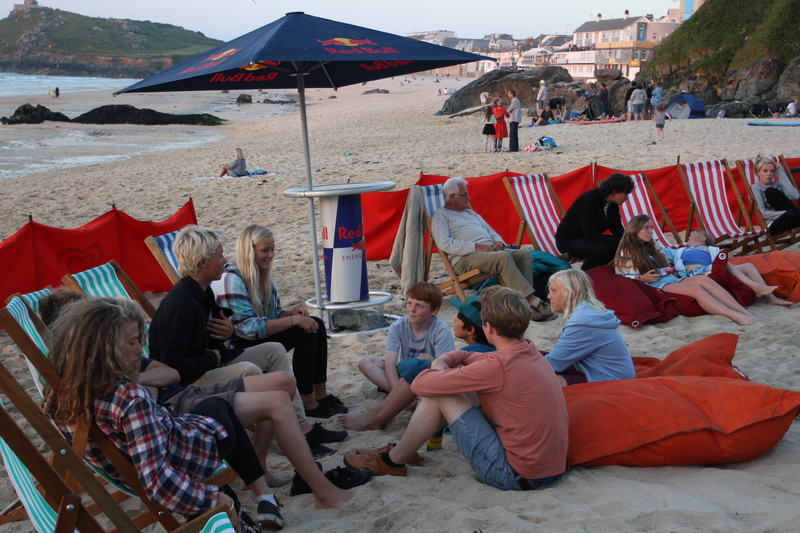 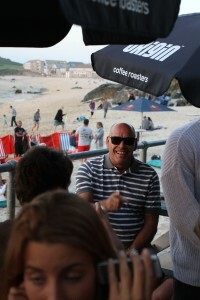 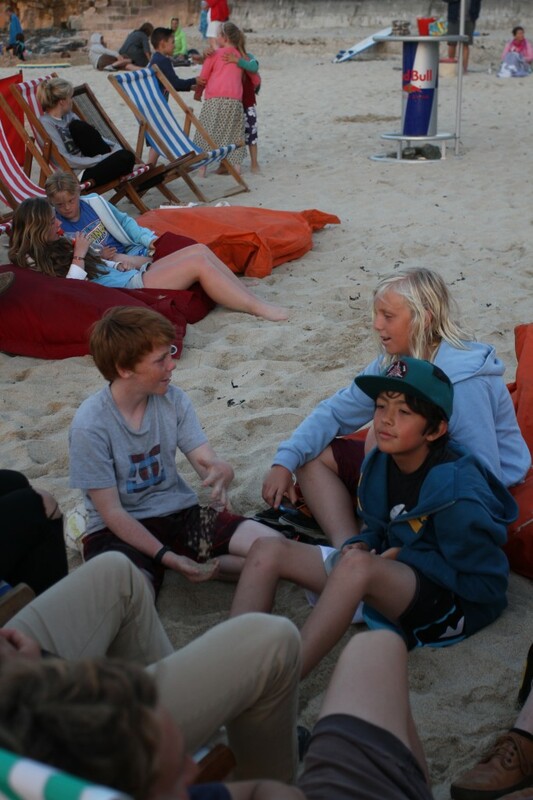 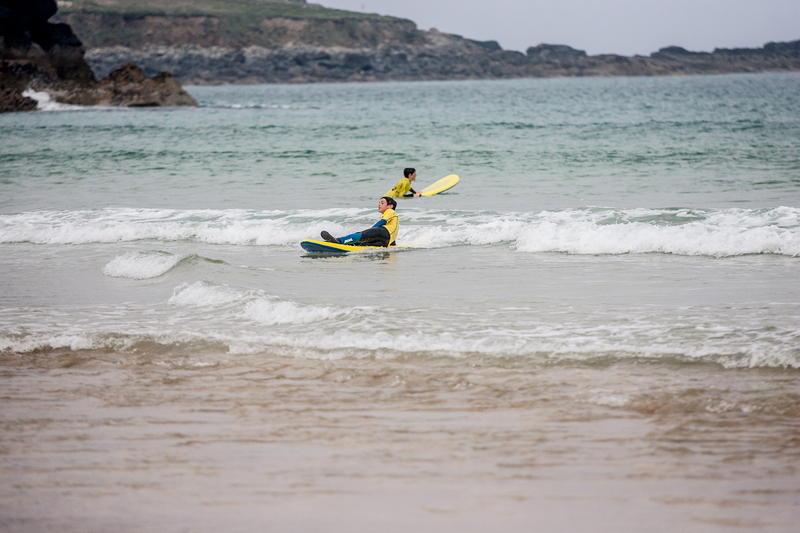 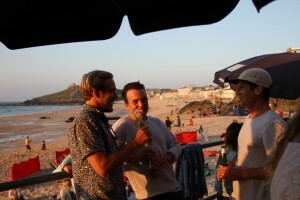 As we waited for darkness to fall on one of the longest days of the year, there was plenty of time to savour the free pizza on offer, courtesy of our hosts Rhythm, Red Bull and Porthmeor Beach. 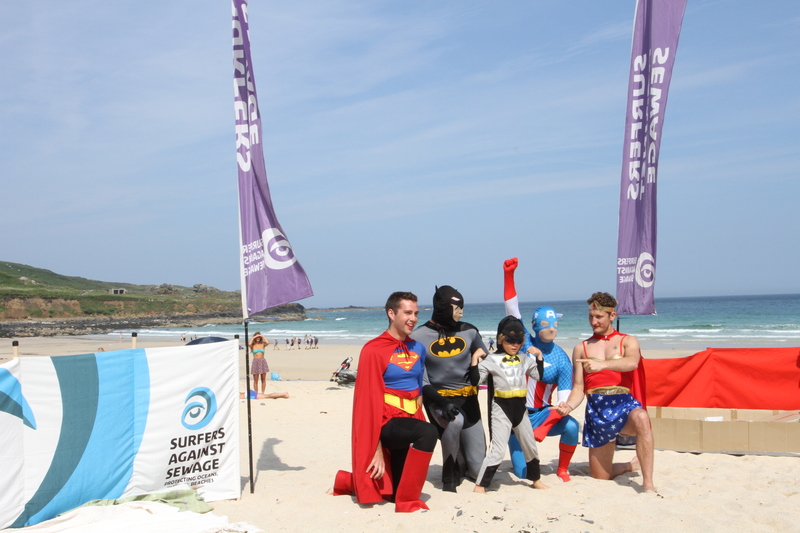 Here’s our last look back at last year’s entries as we prepare for tomorrow’s Fancy Dress Swellboard Shootout to celebrate International Surfing Day. 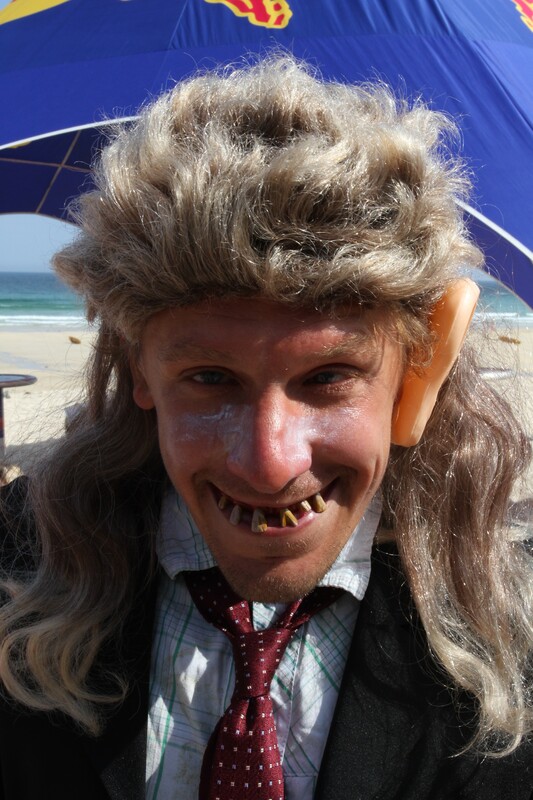 We say a fond “G’Day” to the Tarplee family over in Oz . 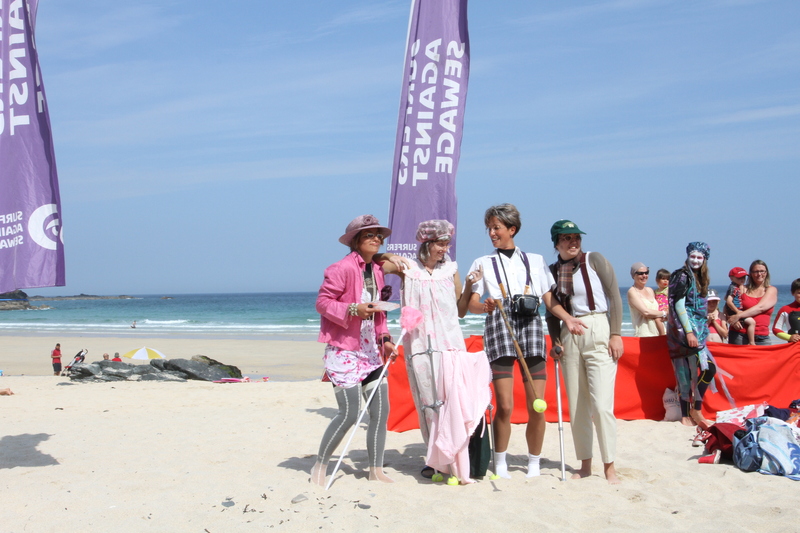 Wish you were here to share this day with us.This Simpson’s outfit was your most recent rig – and the Great White Sharks of a previous year was another splendid effort! 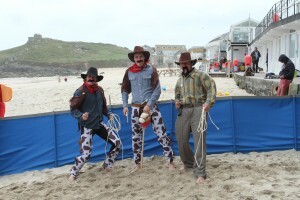 Who will sport the best fancy dress this time? 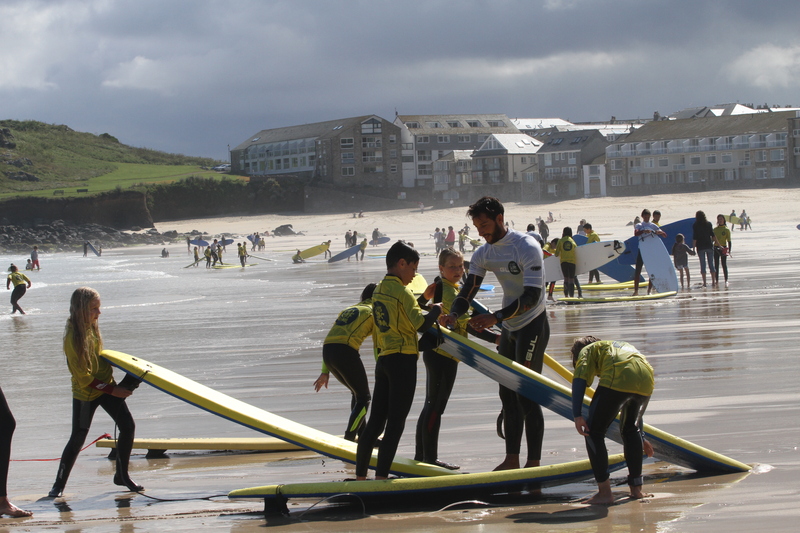 A brief shout-out to all participants in this morning’s Kids Club – Well done all! 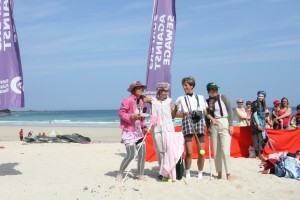 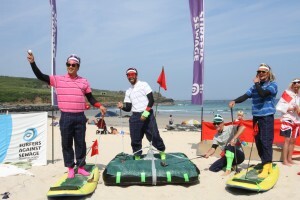 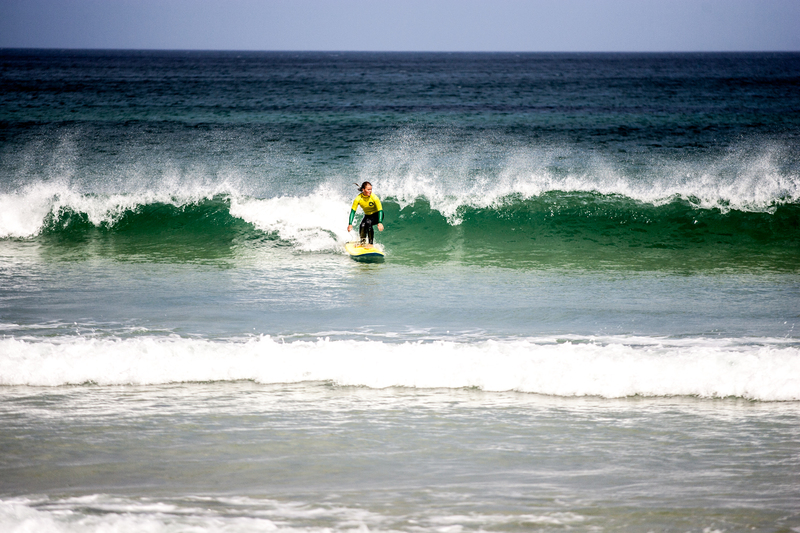 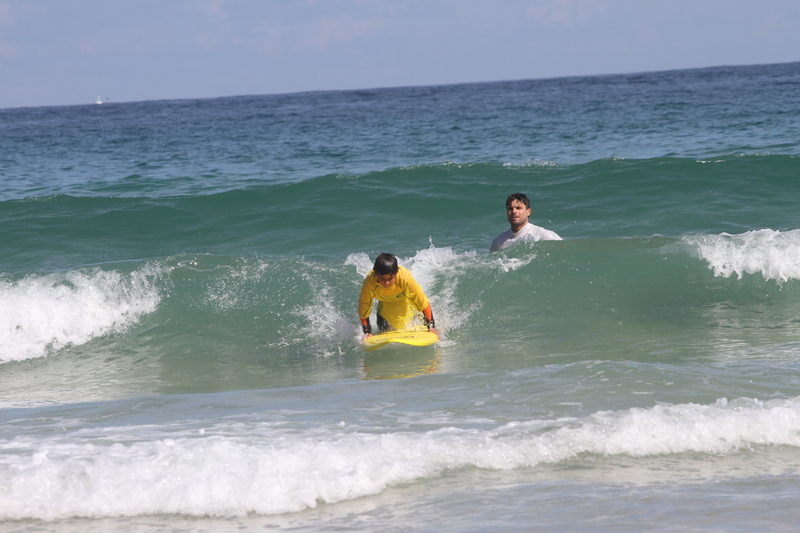 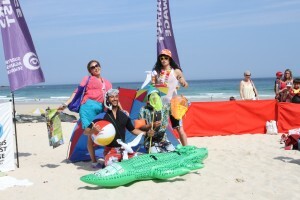 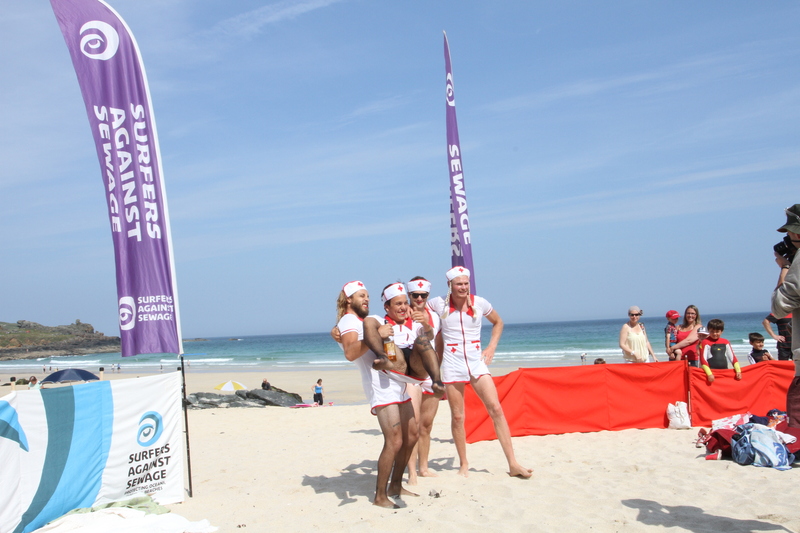 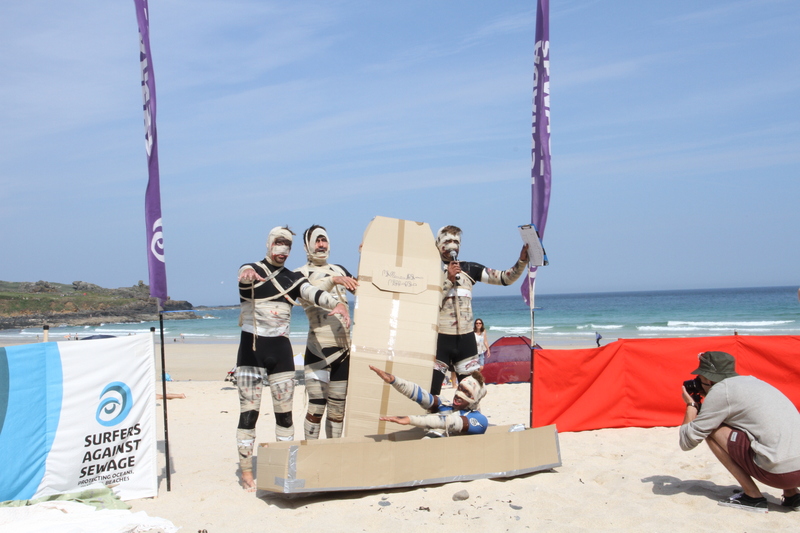 There was some stylish surfing on show, and the Team Swellboard contest among the Outbackers was a pretty gritty affair! 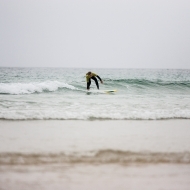 Nick has some pictures to view here– get over there to see if he caught your best wave today. 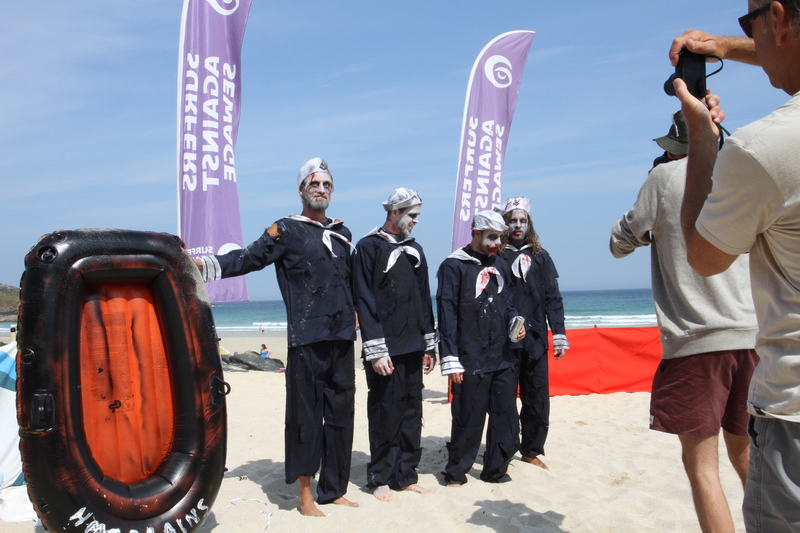 See you at the beach tomorow -10am sharp for all competitors! 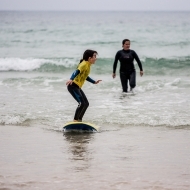 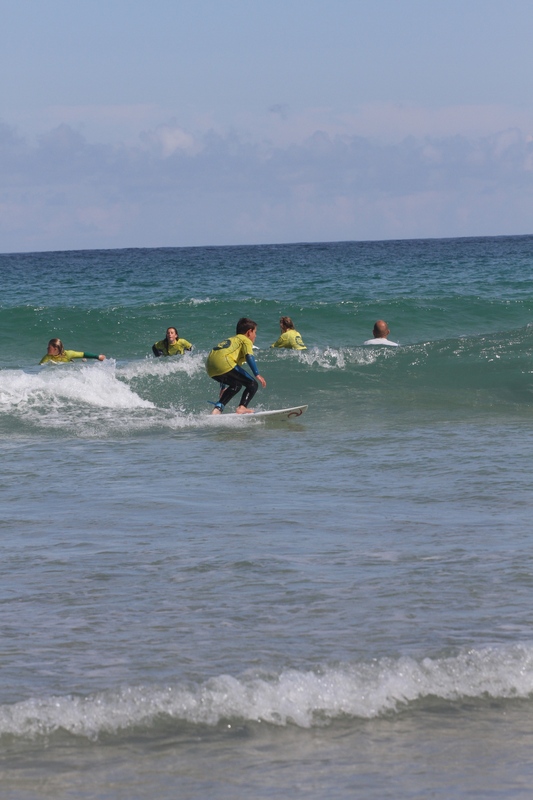 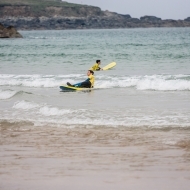 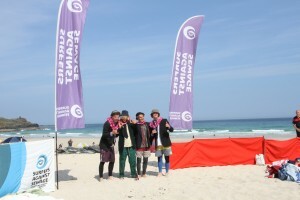 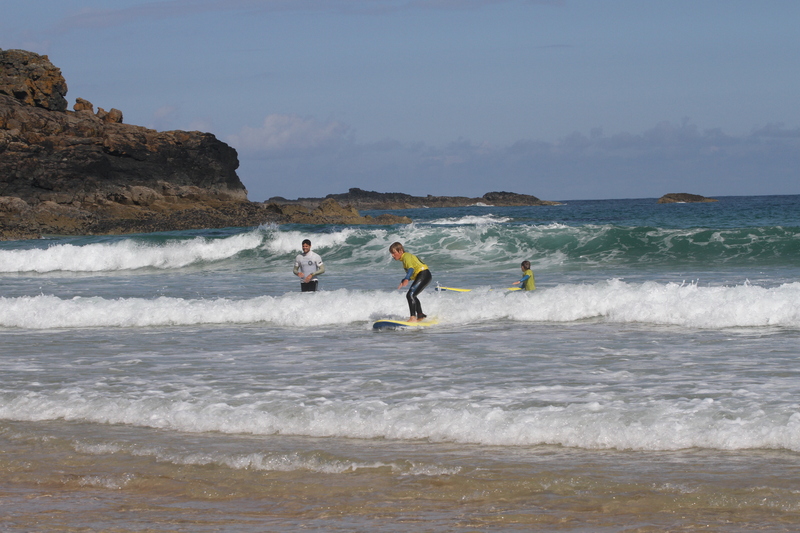 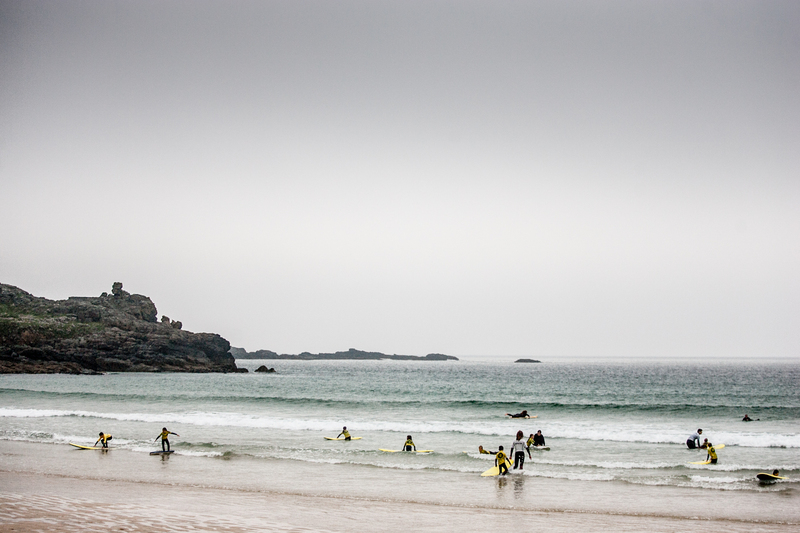 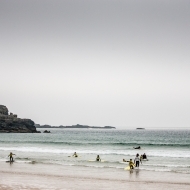 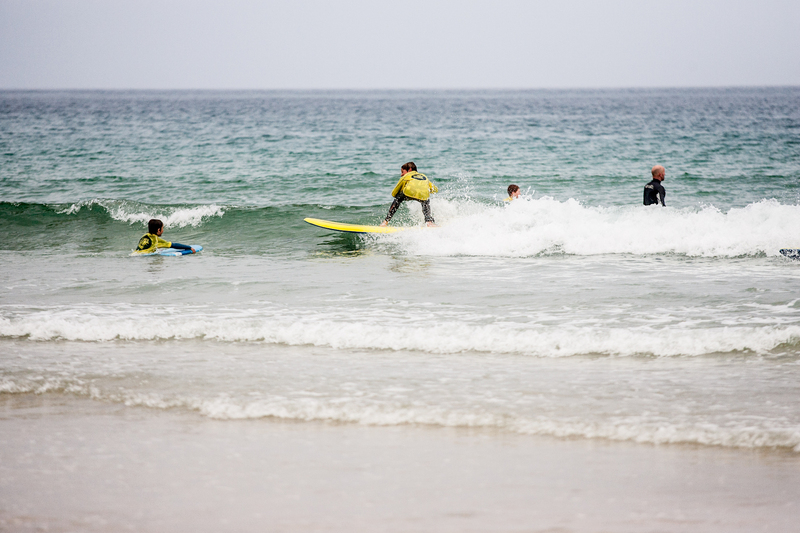 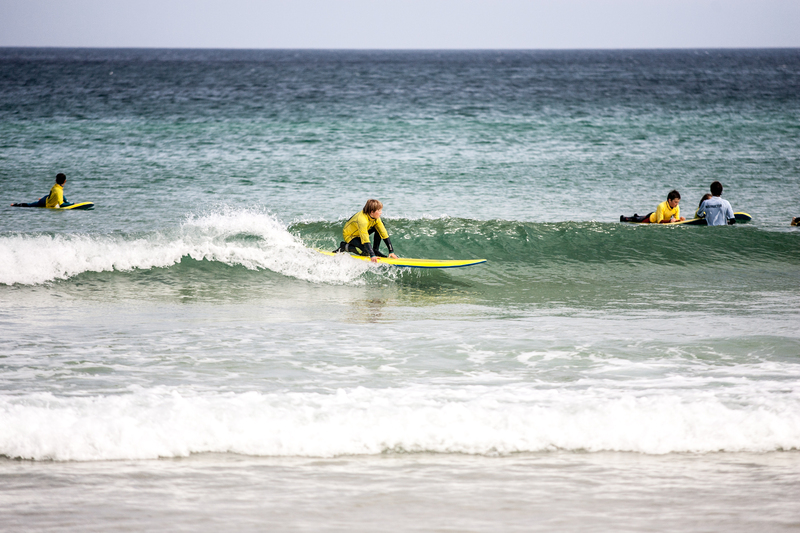 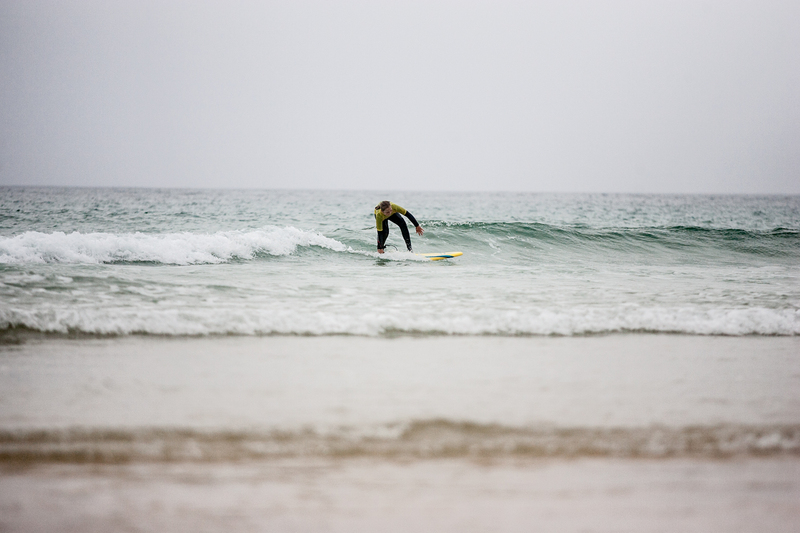 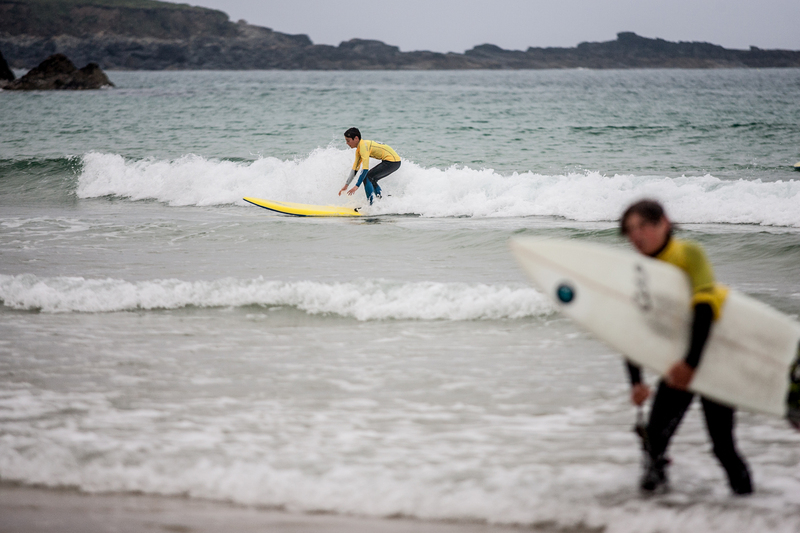 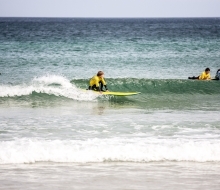 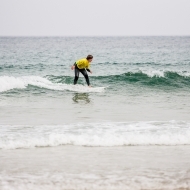 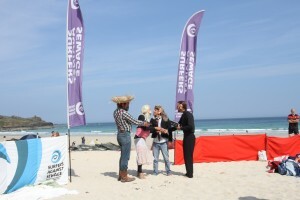 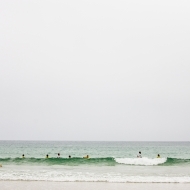 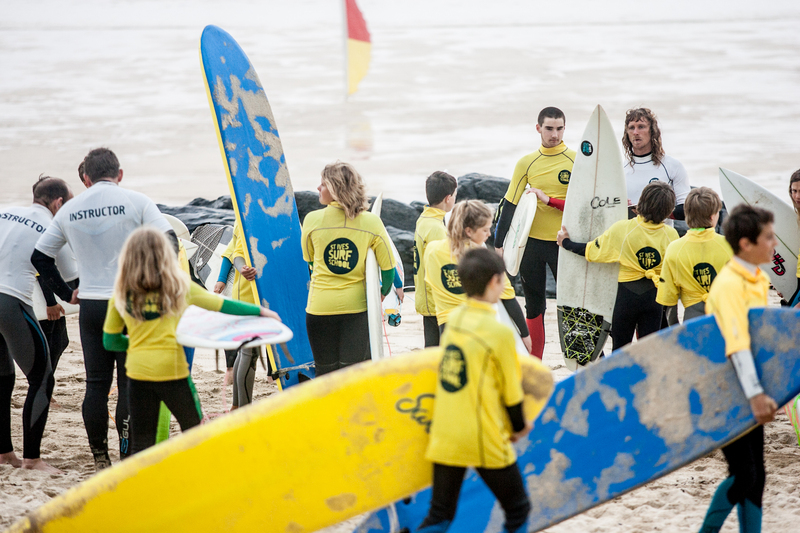 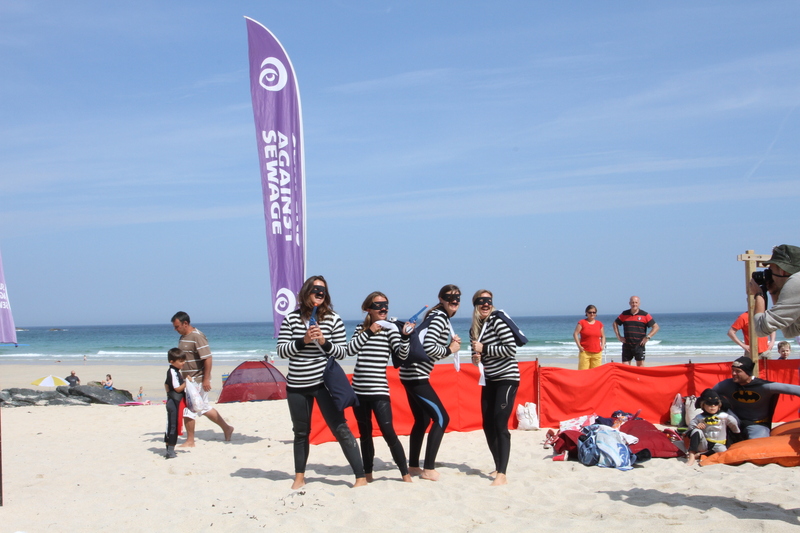 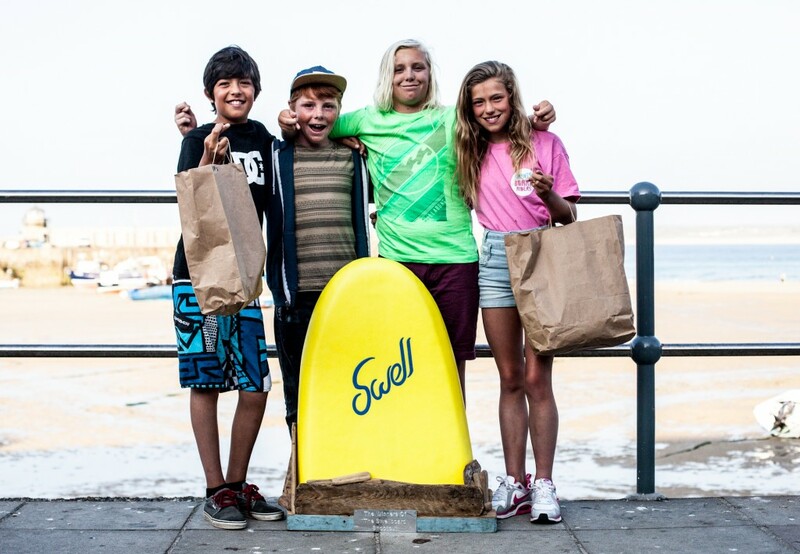 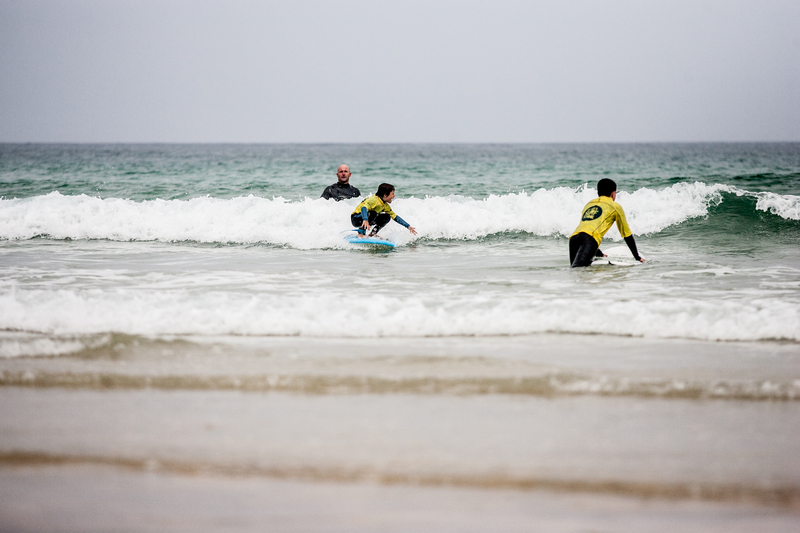 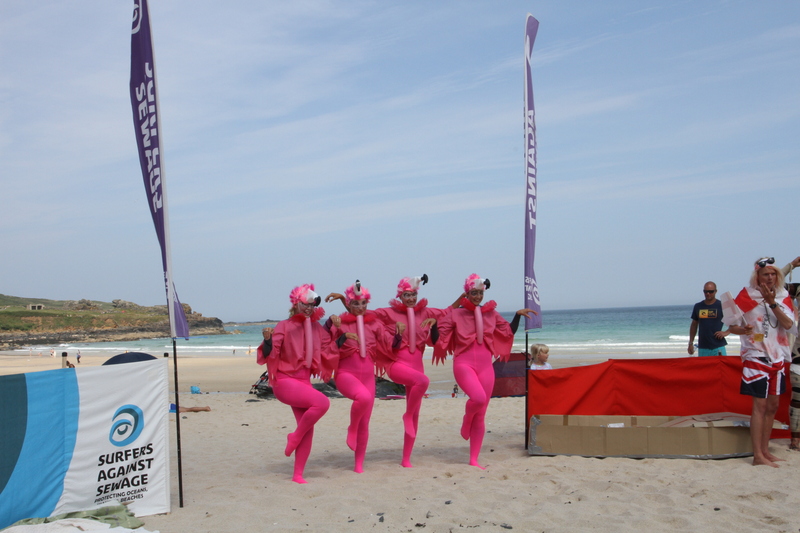 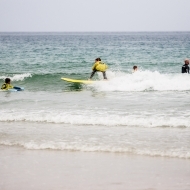 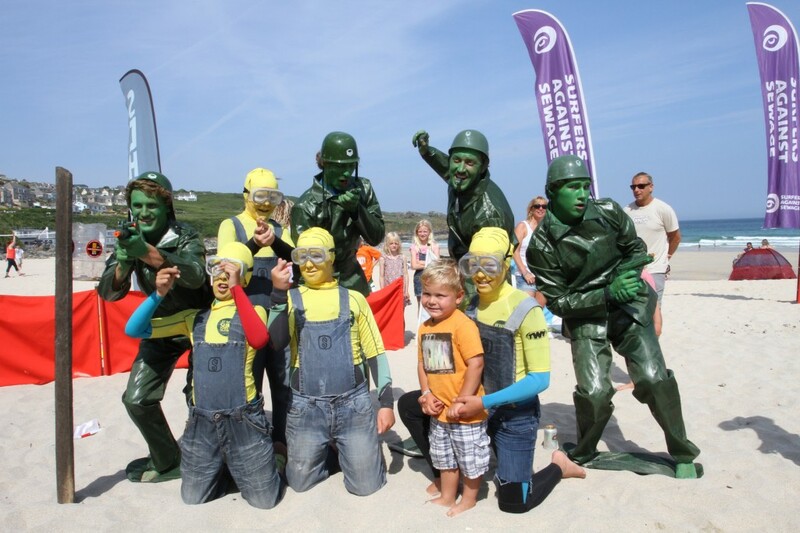 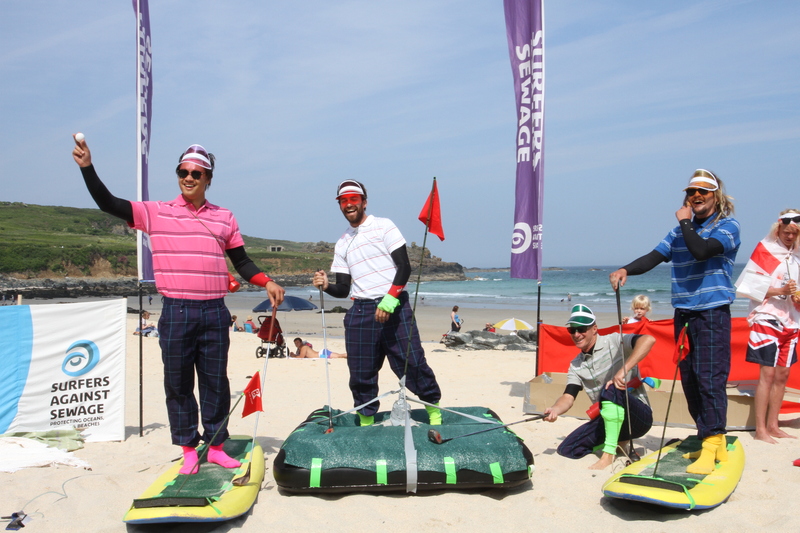 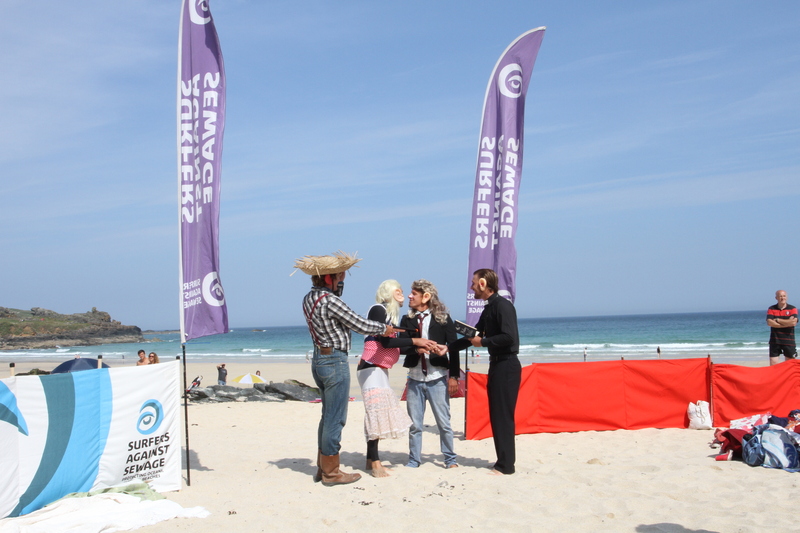 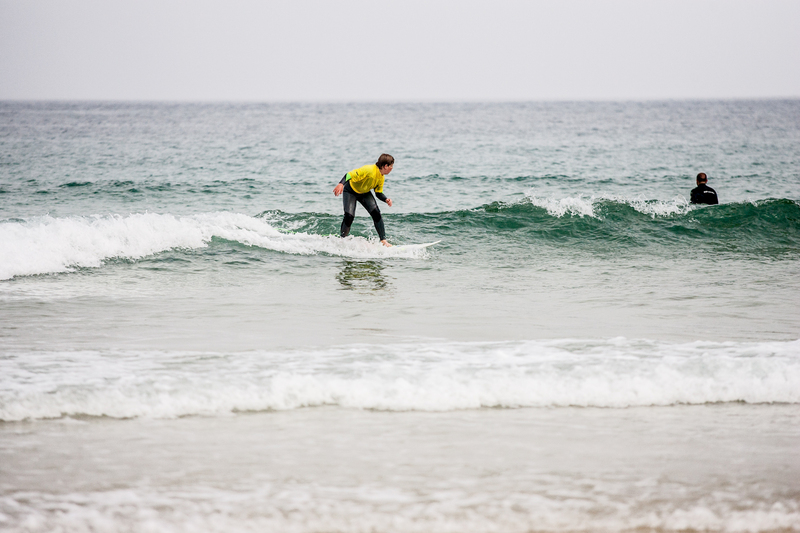 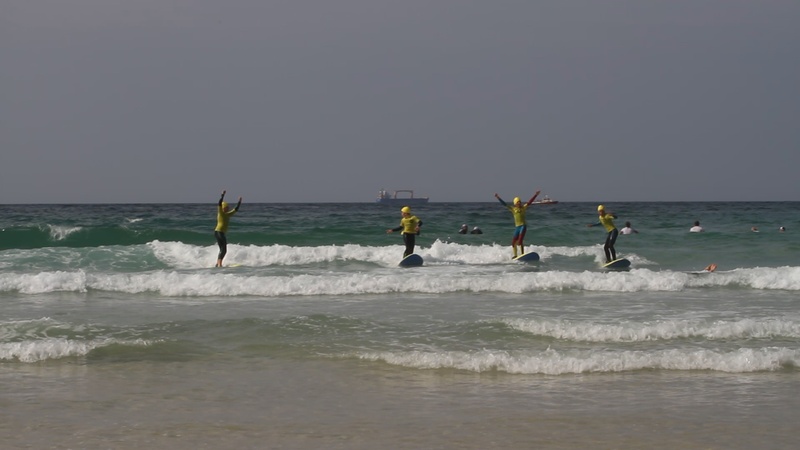 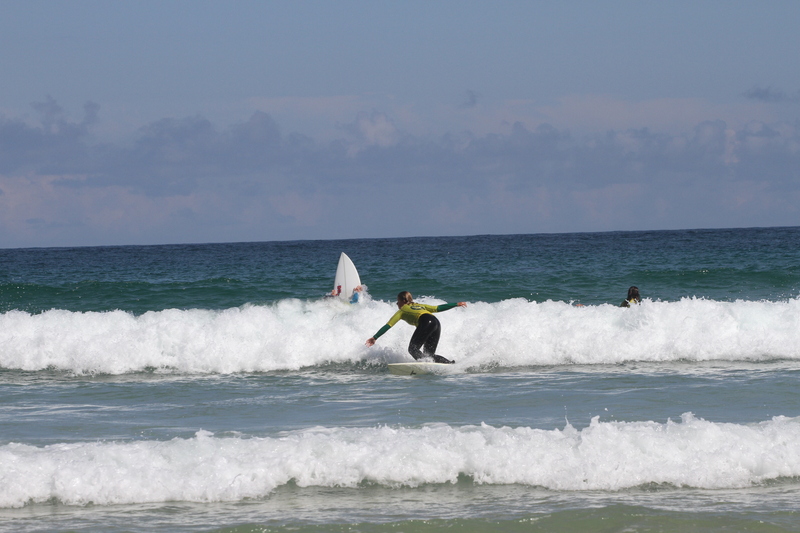 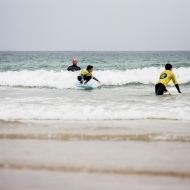 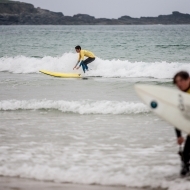 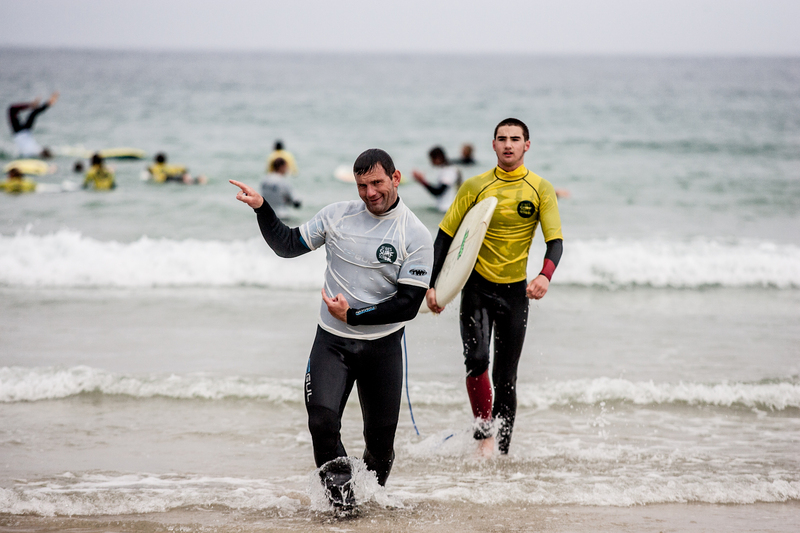 The 2013 Swellboard Shootout finished in pumping surf at Porthmeor with these jockeys the first to take the team wave back to the beach and claim the winners prize. 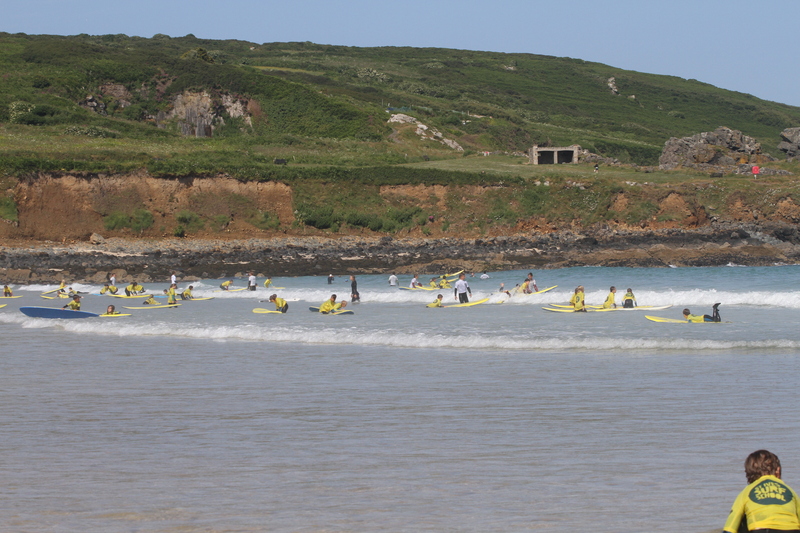 Expect the same personnel in different guises to be challenging again on Sunday afternoon. 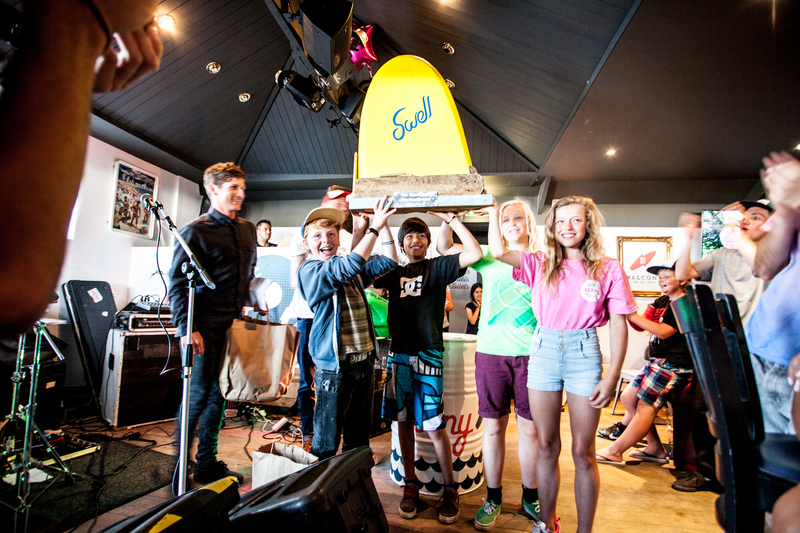 Yesterday I posted a link to the Rhythm edit of last year’s event, here’s a link to the Surf School edit for those who haven’t seen it! 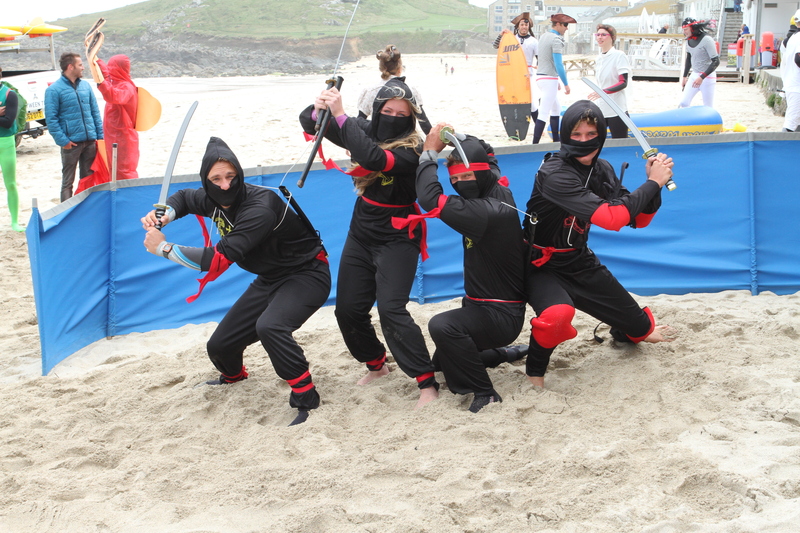 These Ninjas pictured below will also be in the lineup at the weekend – and they have promised another rad outfit to maximise their bonus points. 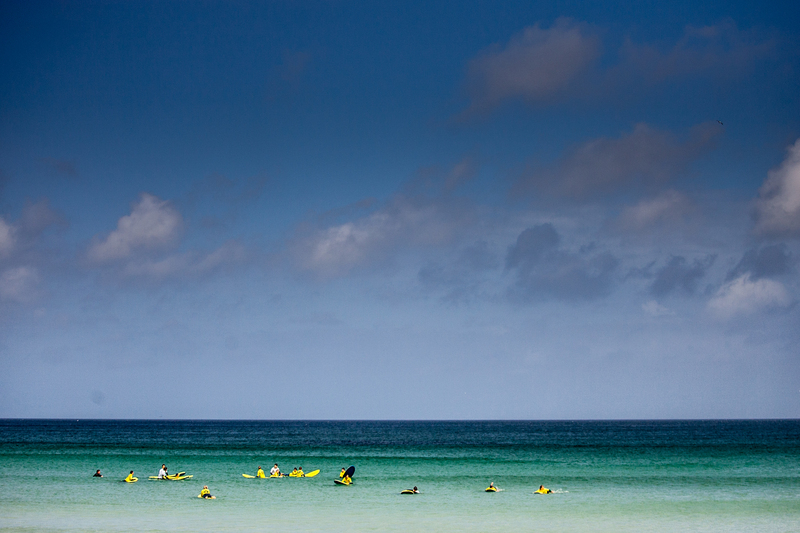 We’ll have one more trip down Memory Lane before the big day. 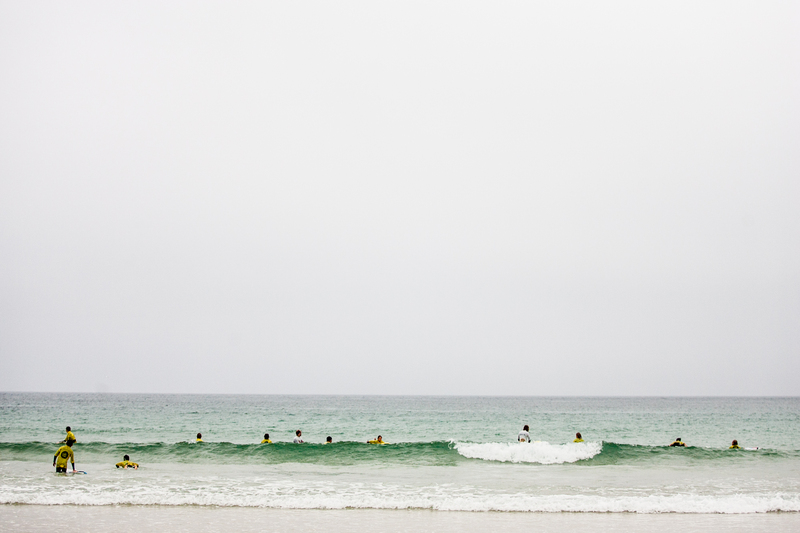 Check back again in the next couple of days. 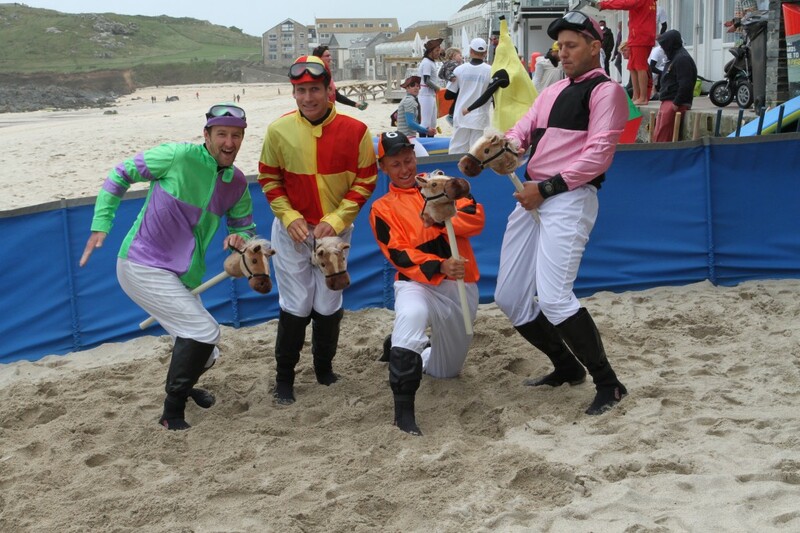 Will we see this team again in 2014? 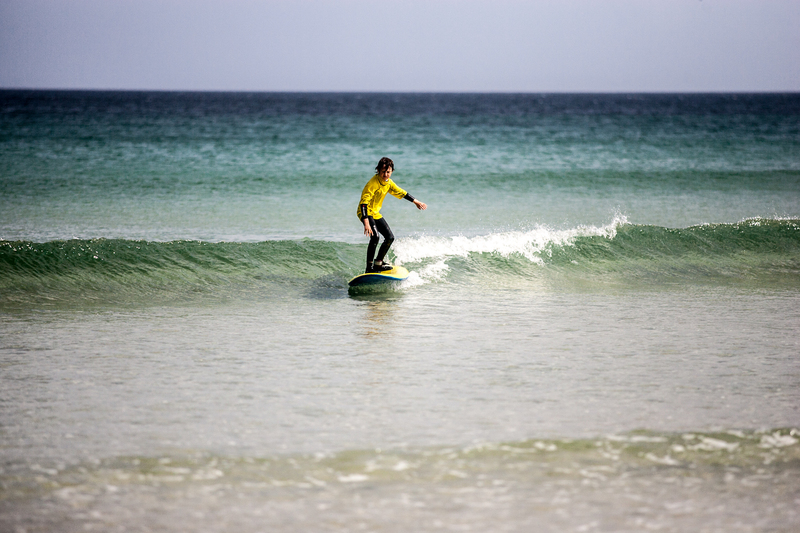 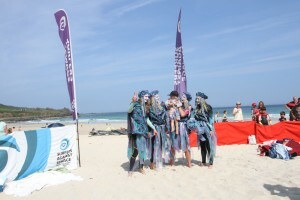 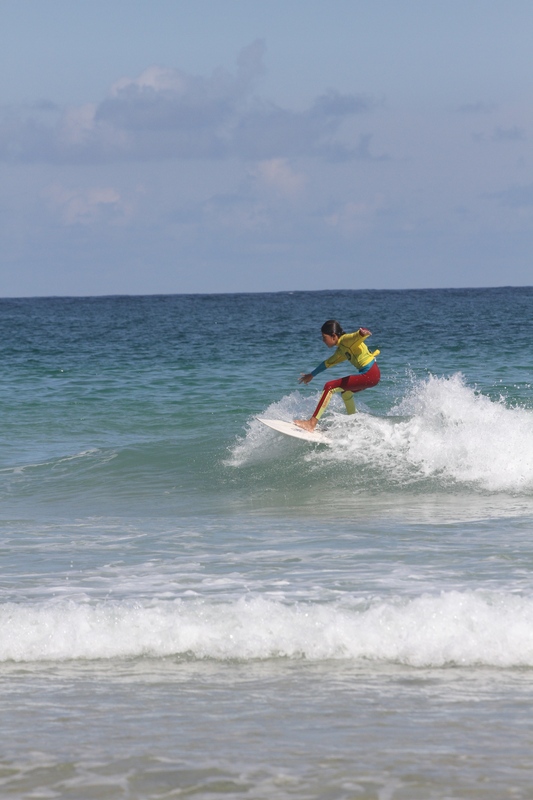 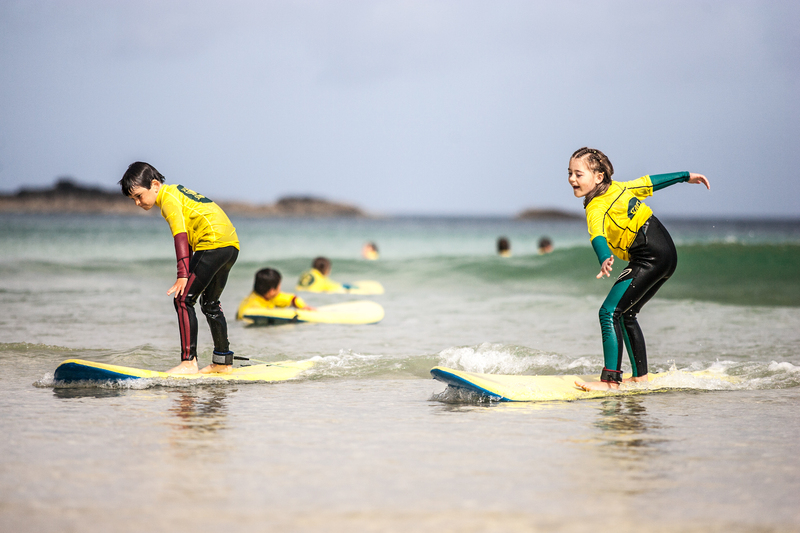 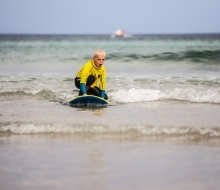 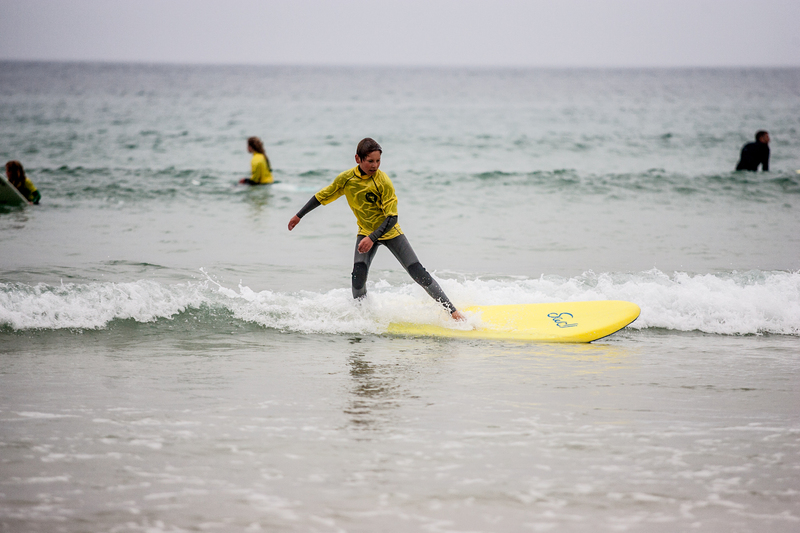 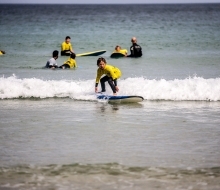 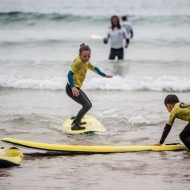 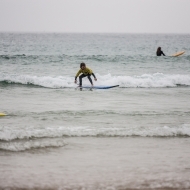 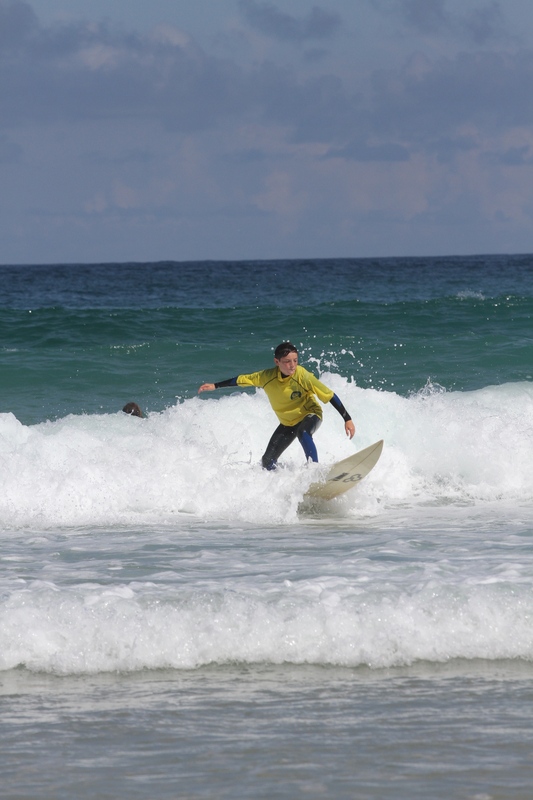 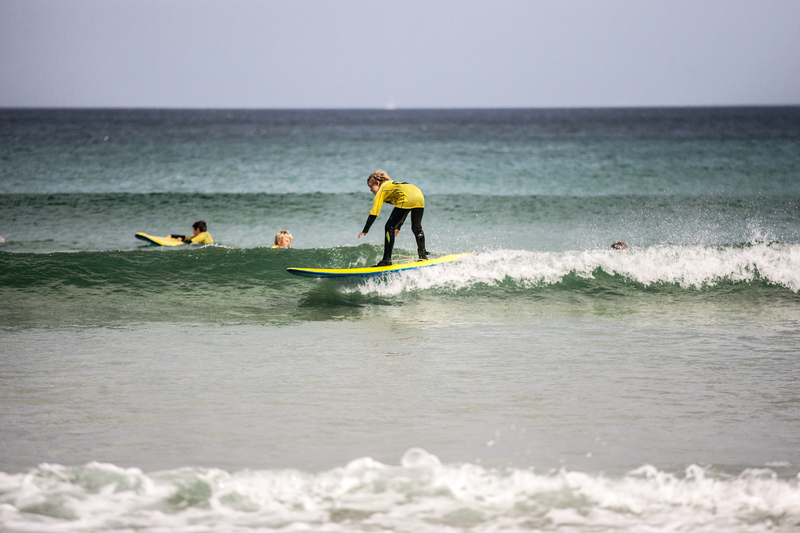 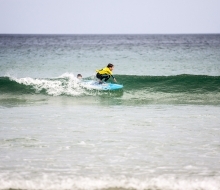 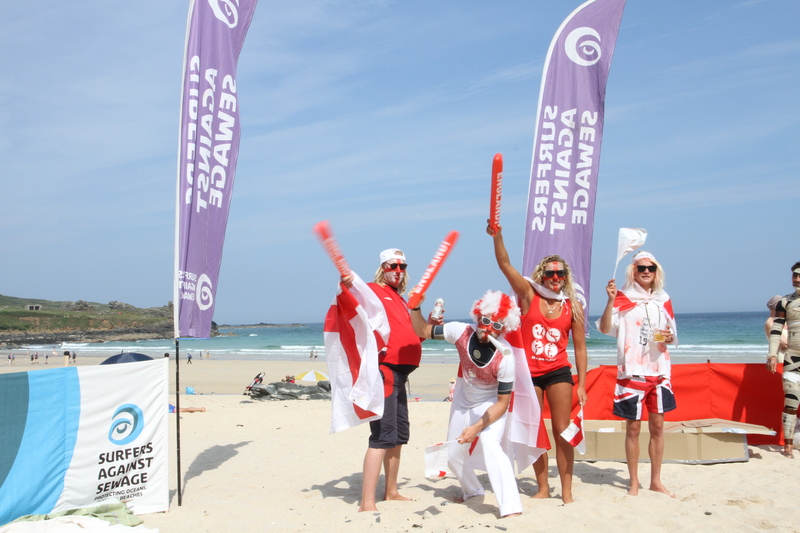 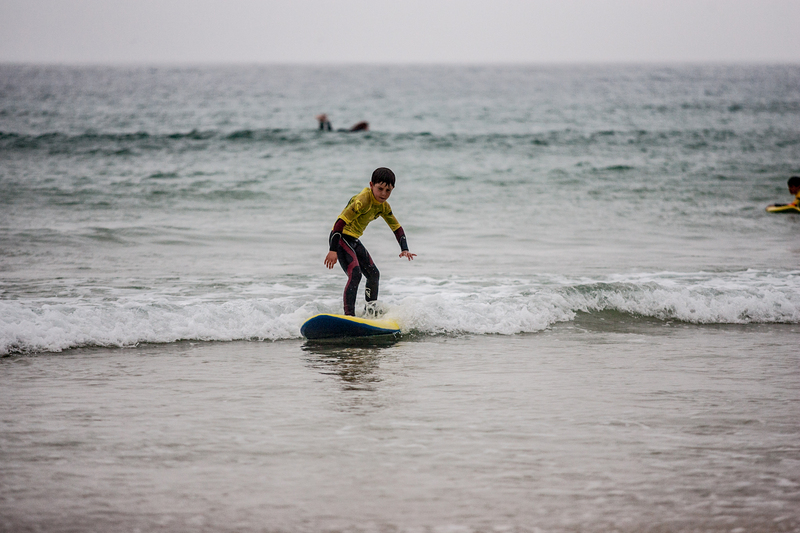 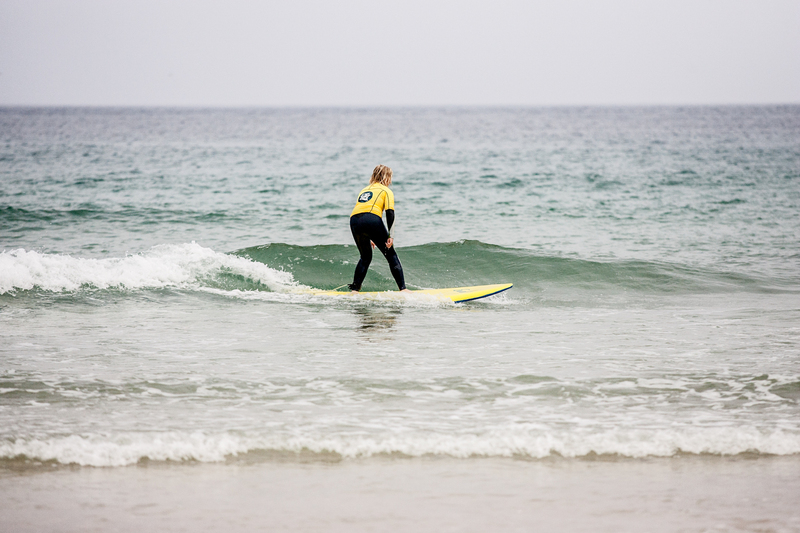 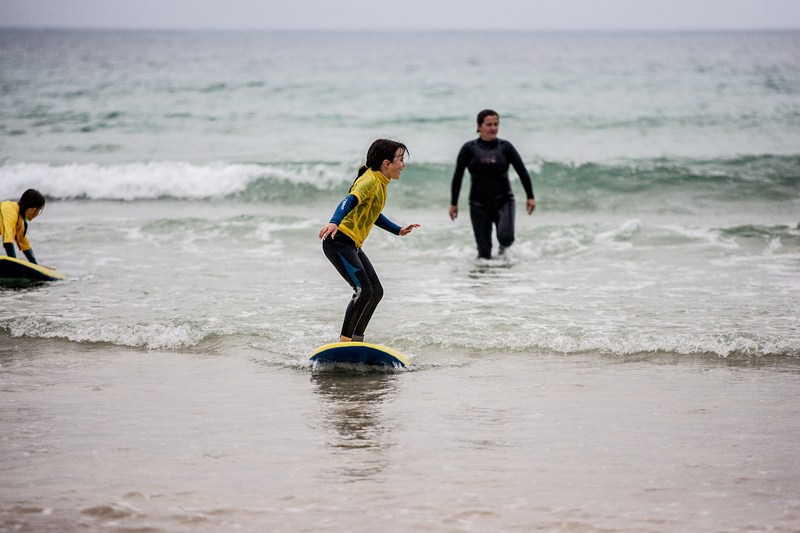 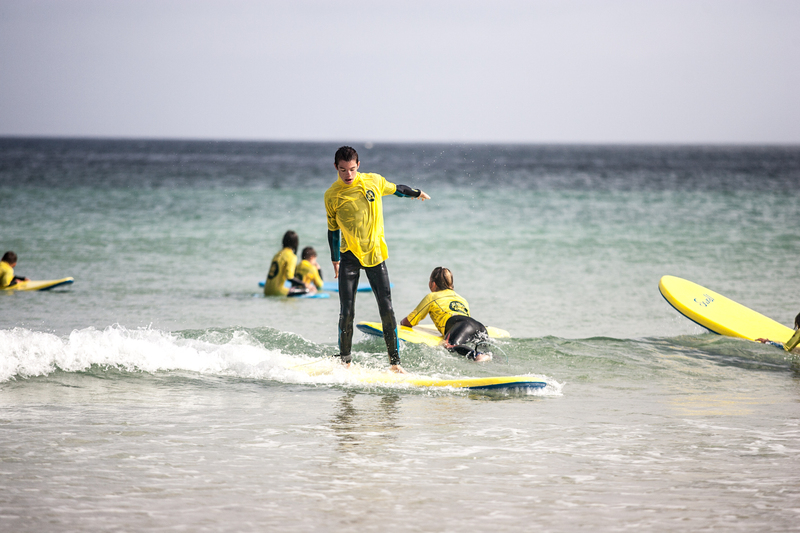 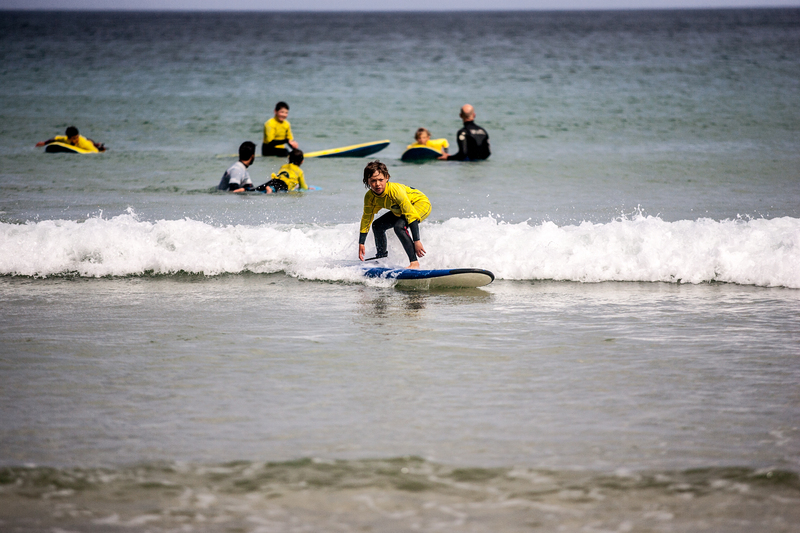 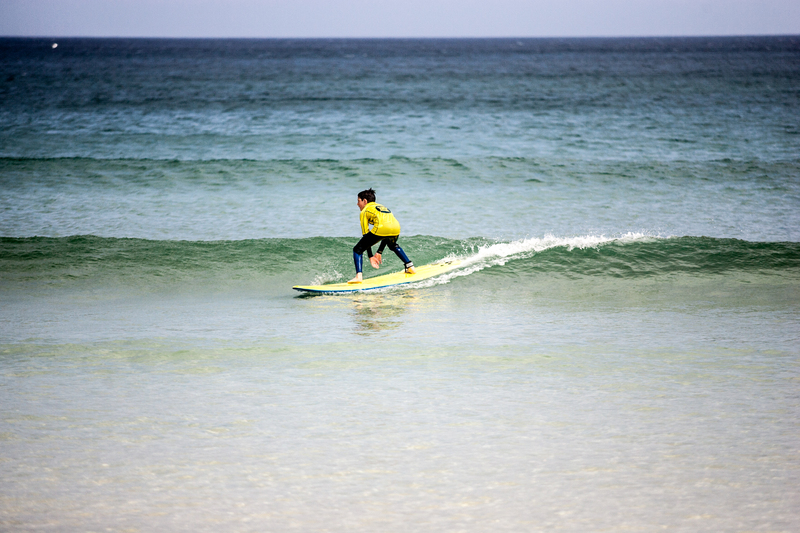 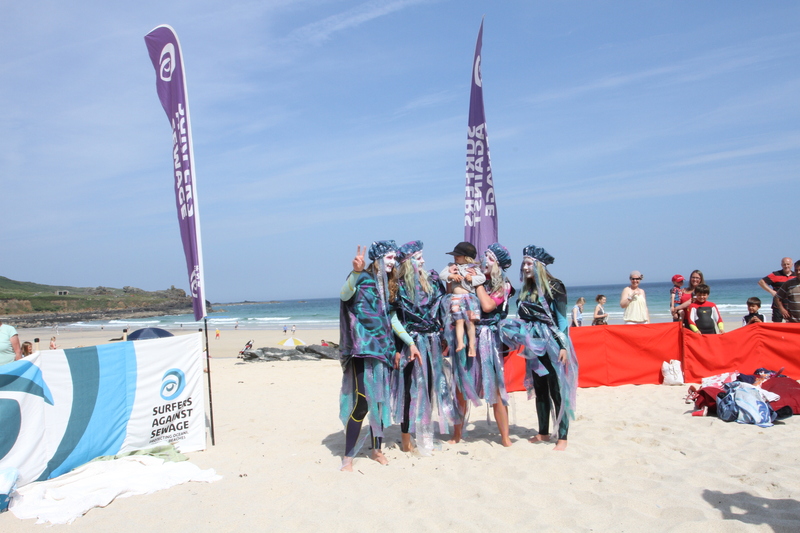 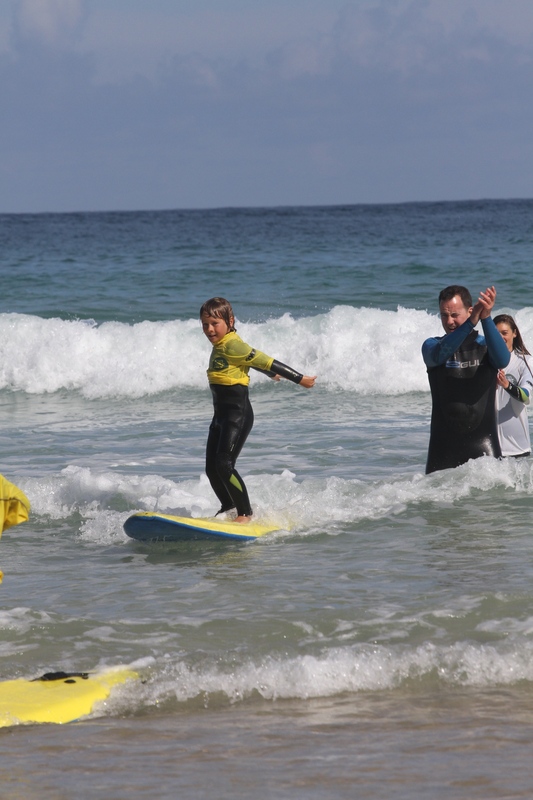 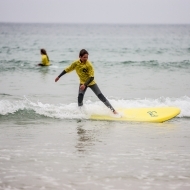 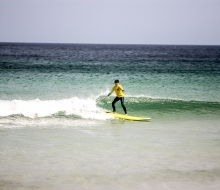 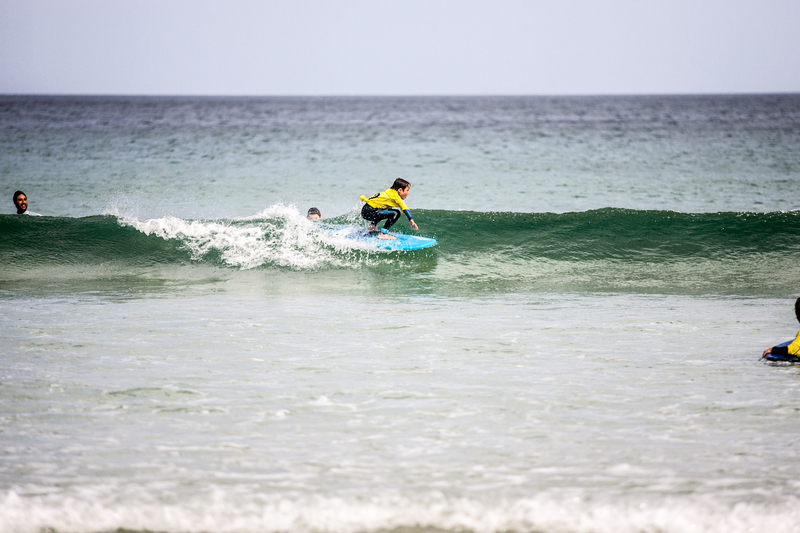 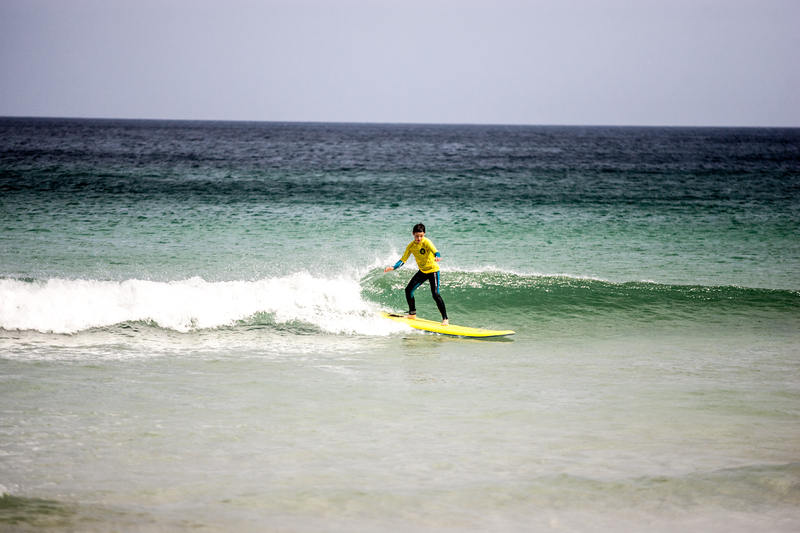 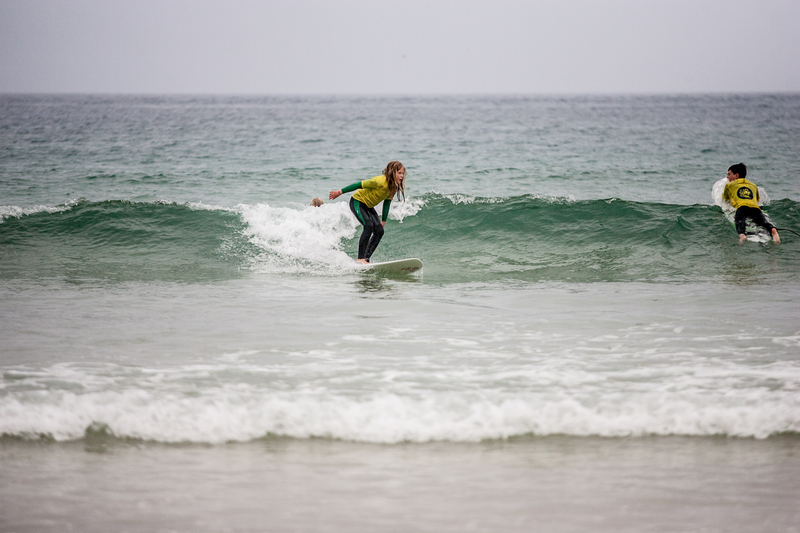 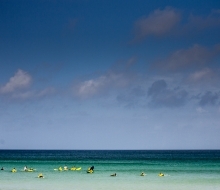 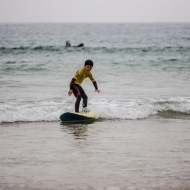 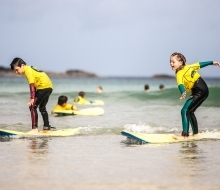 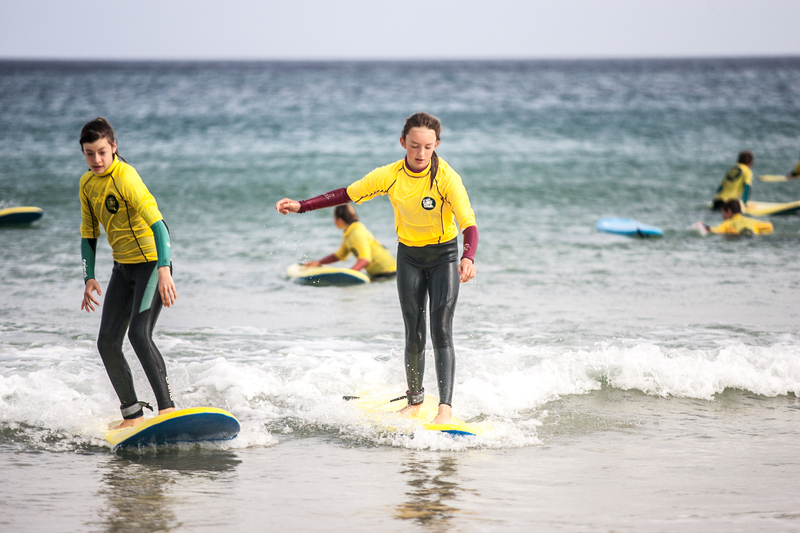 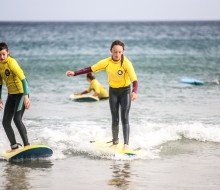 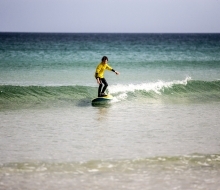 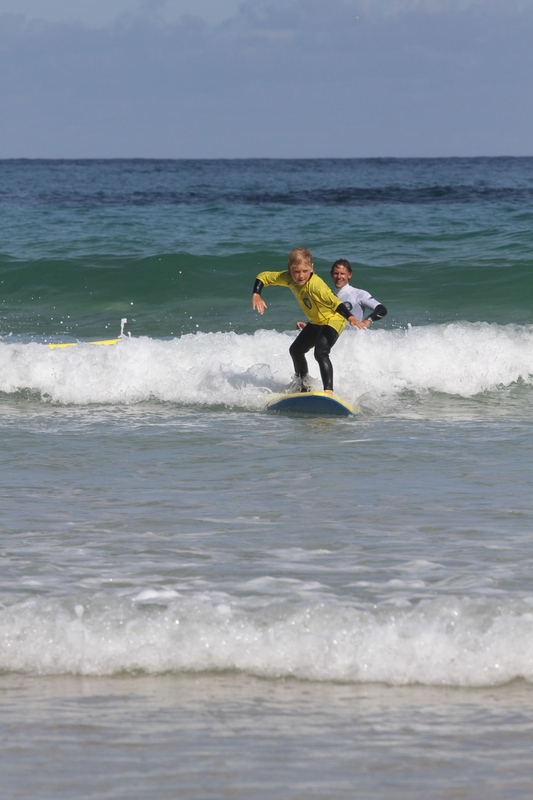 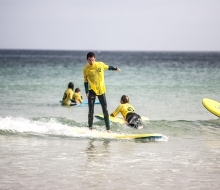 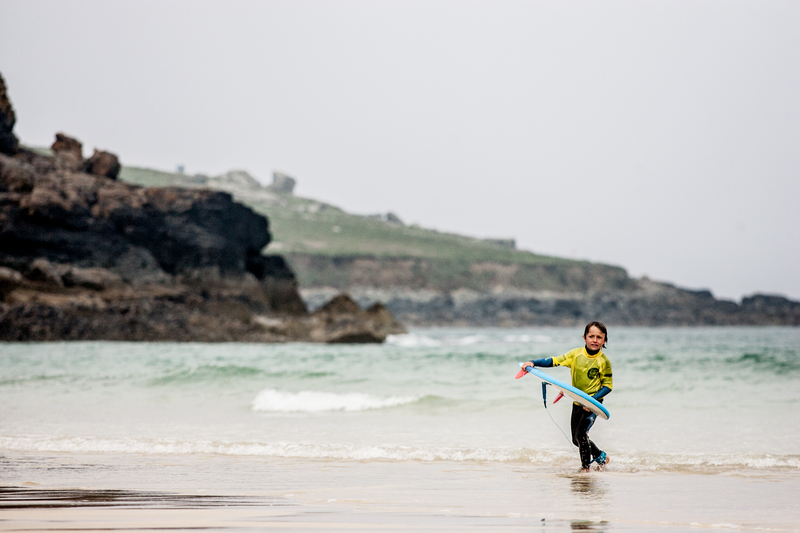 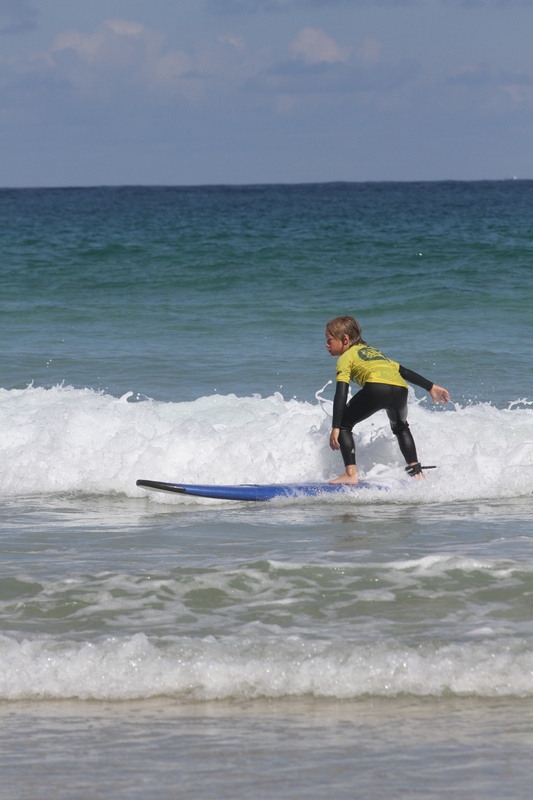 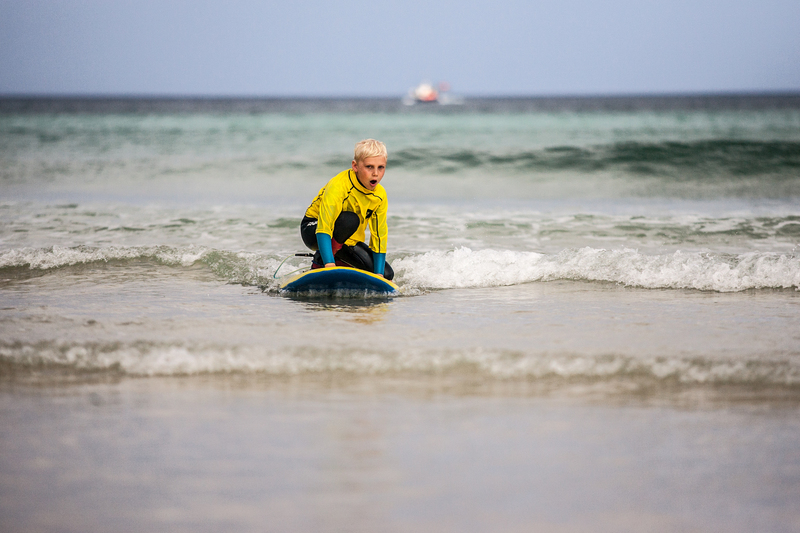 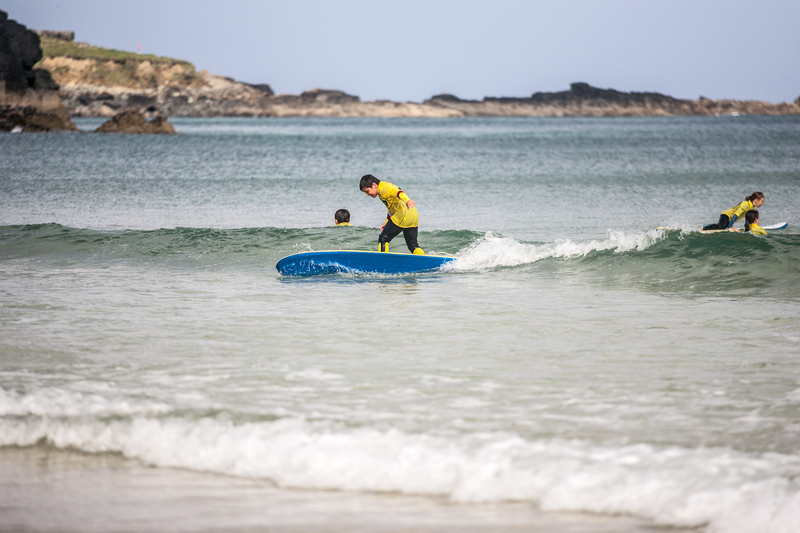 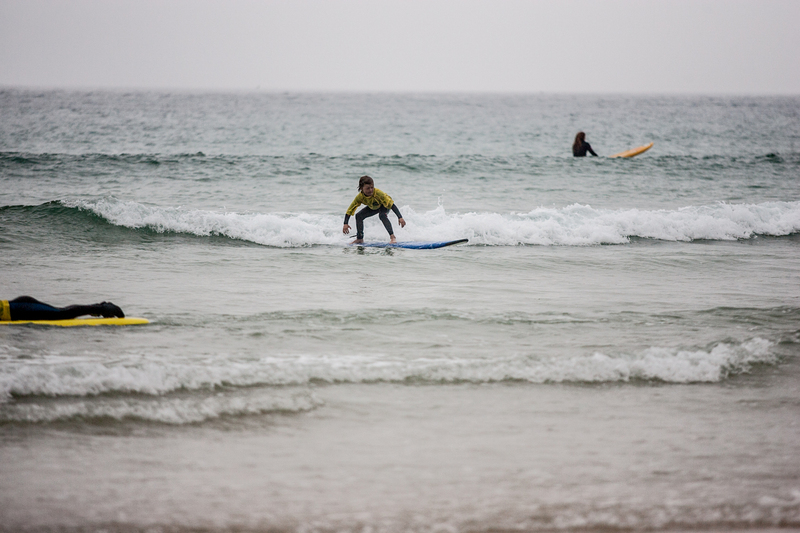 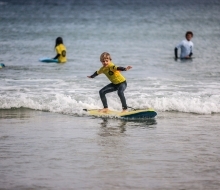 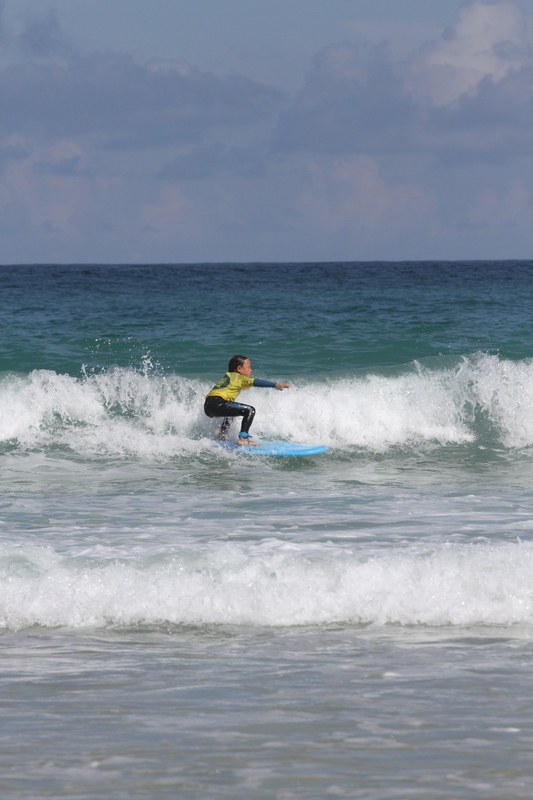 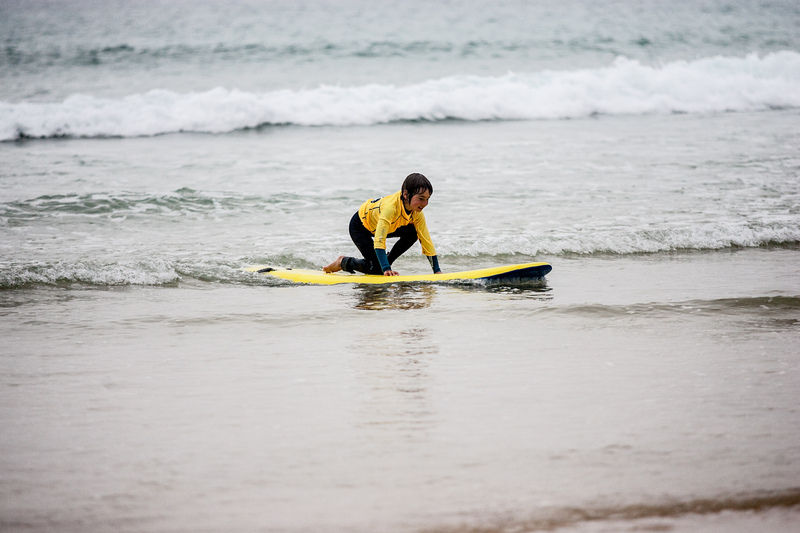 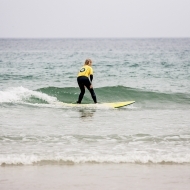 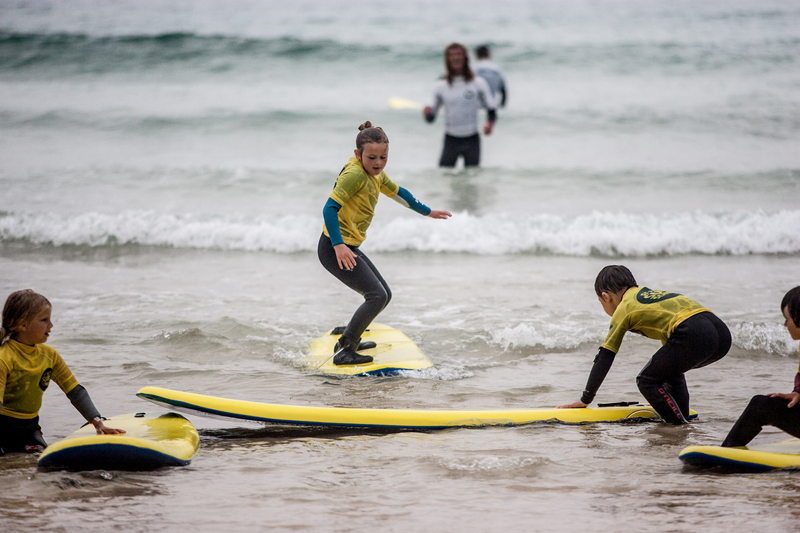 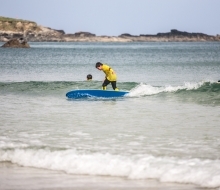 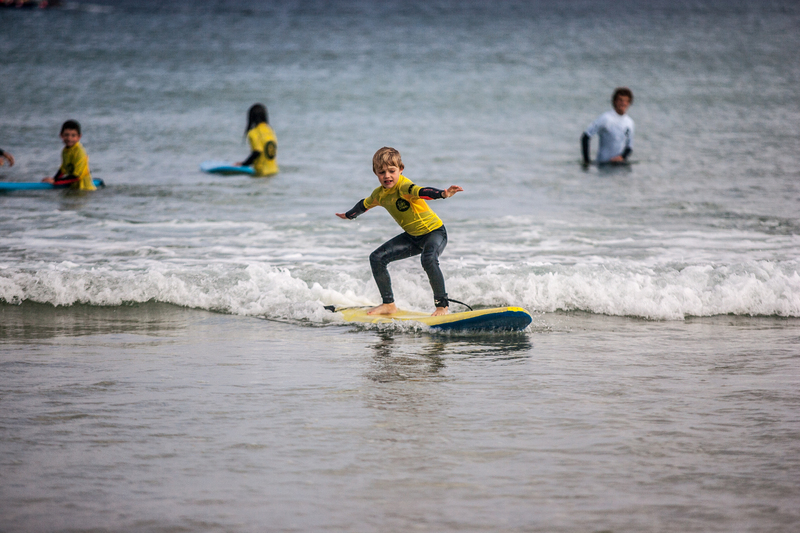 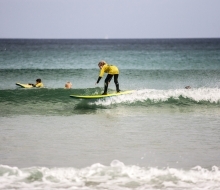 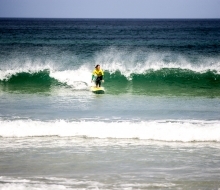 St. Ives Surf School celebrates International Surfing Day this weekend in it’s own inimicable fashion with the 2014 Swellboard Shootout at Porthmeor Beach on Sunday. 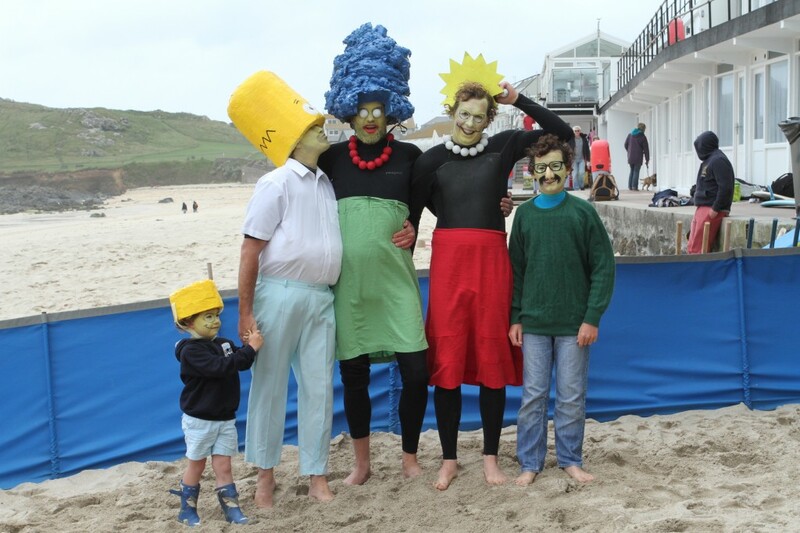 This Fancy dress extravaganza was a tremendous success last year, gathering worldwide attention for the Rhythm video edit of the event – and setting the bar pretty high for this years’ teams. 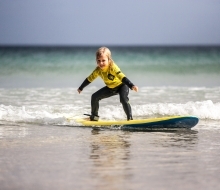 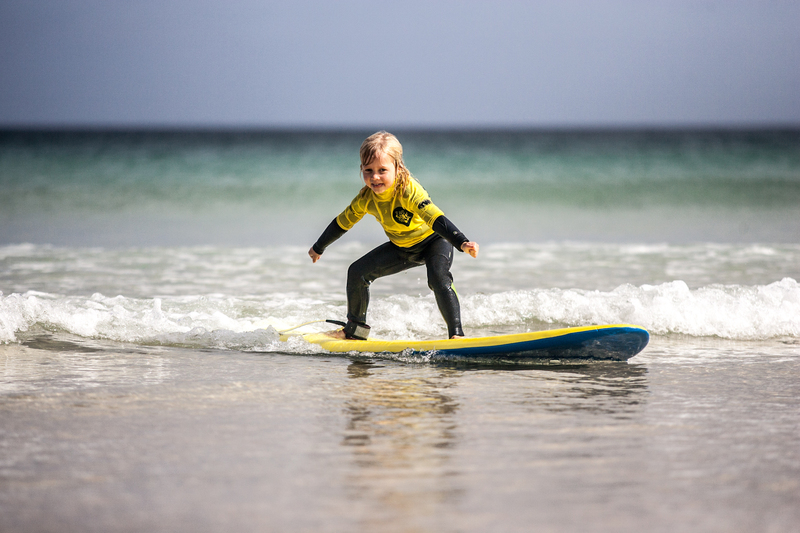 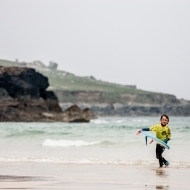 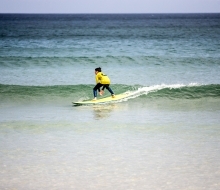 The weather outlook is good, and competitive swellboard action is possible in even the smallest surf conditions, so pack a picnic, slap on the Factor 50 and bring the family down to the beach to catch the action. Saddle up and mosey on down! 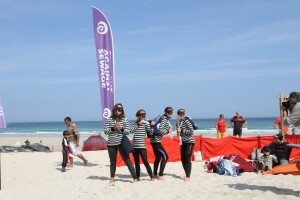 Look out for more pictures of last year’s teams here in the coming days as we lead up to the big day!